WORLD BELONGS TO THE BOLD. The Diavel makes a bold statement and strengthens Ducati’s Performance Redefined mantra by using latest technologies to produce super-smooth performance with enhanced comfort and usability. Custom shop beauty, state-of-the-art technology, innovative design and extraordinary riding pleasure are masterfully blended into the Diavel, a motorcycle that has firmly set a benchmark in the sport cruiser segment, just reward for the innovative designers and engineers that created it. Built to have a commanding presence, though lightweight and agile like all Ducatis, the Diavel takes the man-motorcycle relationship to another level in absolute comfort. For connoisseurs of technology, the Testastretta 11° Dual Spark engine combines with ABS, Ducati Traction Control and Ducati Riding Modes to deliver a confidence-inspiring superiority, while the bike’s styling, 162 hp and 205 kg* (452 lb) of pure Ducati drives a comfortable sport lifestyle previously only dreamt of. Merging the worlds of power and style is achieved with convincing precision. A specially engineered 240 mm section rear tyre combined with Ducati chassis technology serves up mind-blowing handling and lean angles which defy the laws of physics, whether carving through curves on your favourite road or simply cruising the boulevards. 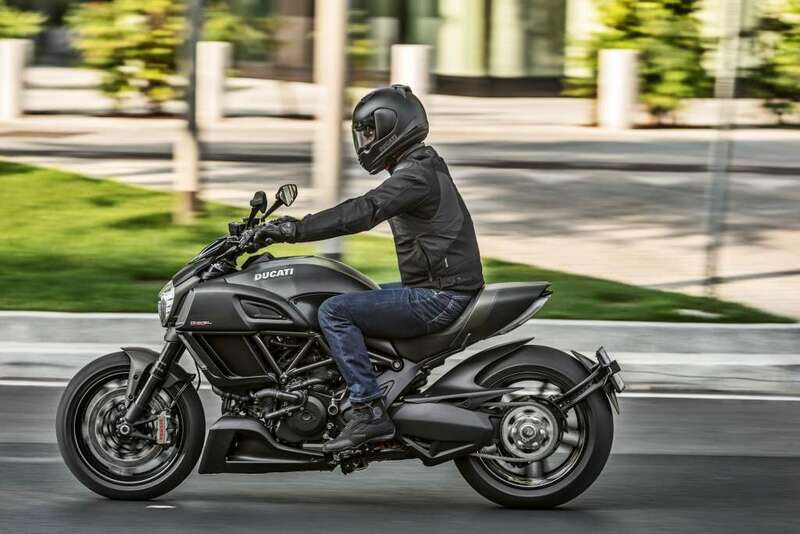 With its laid-back street ergonomics, blistering performance and commanding style, the Diavel rolls out dressed in stylish Dark Stealth livery, a black trellis frame and black wheels. The Diavel Carbon livery elegantly balances with the visible carbon, the red stripes and the Dark Chrome paintwork on the frame. The exclusive forged wheels with exposed machined finish, enhance the muscular design of the bike. 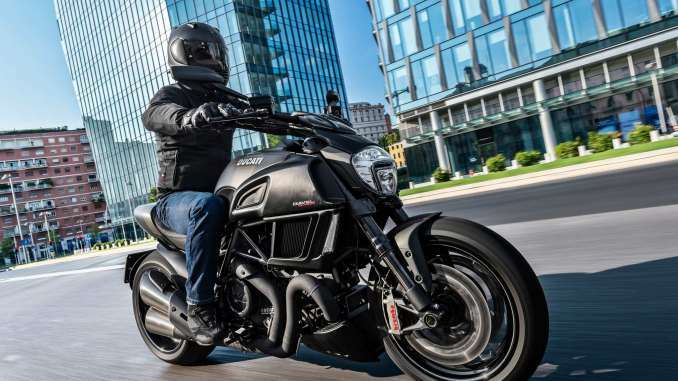 If the stance of a Streetfigher is that of “anger,” the stance of the Diavel is of readiness, dominance, and confidence bordering on superiority. With lateral radiators adding muscle to its broad “shoulders,” which then taper down across the engine and into the belly-fairing with oil cooler, the athlete took shape. A massive 240 mm section rear tyre was a perfect example of how Diavel designers used a no-compromise attitude when applying their wish list of features. The sheer width of rubber communicates so much power and style that the R&D team vowed to find a way to make it handle – even if they knew the image would send a seismic shock through the industry. Ducati’s philosophy for innovation has always been to push the boundaries of design in the name of exciting motorcycles. Sometimes “gut feelings” are what count, and having the strength to commit to them shows the bold statement that Ducati has made. The Diavel is a true Ducati, born from a passion for motorcycling and designed to deliver authentic Ducati performance in every respect. Reminiscent of how the “Monster” was named, the Diavel follows the same Bolognese tradition, shaping the future of motorcycling while staying faithful to its heritage. The Diavel’s twin-level seat is wide, comfortable with a horizontally-ribbed seat upholstery beautifully formed to fit the flowing lines of the machine, further enhanced with red stitching on the Carbon red model. The low 770 mm (30.3 in) seat and low slung chassis set-up that weighs in at just 210 kg (463 lb.) – 205 kg (452 lb.) for the Diavel Carbon and the Diavel Titanium – enables the rider to get both feet on the ground for a sure-footed and confident stance. The seat also comes with a stylish and easily removable single seat cover, which is formed in carbon fibre on the Diavel Carbon. Passengers of the Diavel, Diavel Carbon and Diavel Titanium will appreciate the way the slender passenger footpegs ingeniously fold down from the rear sub-frame as well as the innovative, T-bar shaped grab-rail assembly, which slides out from the rear of the seat. Deployed from a mechanism under the seat, the grab-rail provides a comfortable and confidence-inspiring grip for the passenger, while the shape perfectly blends into the lines of the tail-piece when retracted. Both passenger-friendly features are crafted in forged aluminium and shot-peened for strength and uniform finish before being black anodised to become almost invisible when folded away. The Diavel is equipped with a full LED headlamp to complement the characteristic twin vertical strips of LED lights, that provide tail and brake light illumination and directional indicators at the rear. The rear LED strips follow the precise line of the under-seat panelling, providing great visibility of the rear-end while keeping the external lines of the bike clean. The front directional indicators are clear lens LED, updated to solid strip technology mounted vertically down the leading edge of the also restyled lateral radiator covers. Mounted in a brushed-aluminium outer body, the totally redesigned headlamp gives the Diavel immediate identity using stylish LED positioning lights to create a stunning surround effect for optimum visibility. Employing the double strip of multi-functional LEDs for the rear lighting of the Diavel required an innovative solution for the mounting of the number plate. The unique design uses mounts on the rear hub of the single-sided swingarm to extend an elegant framework around the 240 mm section rear tyre, enabling a central mounting of the plate. The framework carries a hidden power feed to dedicated LED illumination for the number plate, eliminating any reliance on the main rear lights and enabling a clean feature around the rear of the seat. The Diavel’s 17 l (4.5 US gal) fuel tank represents an integral part of the bike’s overall styling. Its wide, long lines sweep down from the headlamp assembly into the seat and rear sub-frame to create a seamless profile. While the focal point of the tank is the high resolution display panel, the steel tank skin and well-sculpted knee panels add a solid feel to the Diavel and a high tech composite look to the Diavel Carbon. On each side of the front of the tank and feeding the engine’s large airbox are muscular looking intake ducts bigger and in carbon fibre in the Diavel Carbon, formed in black anodised, brushed-aluminium. Their design is completely functional and contributes to the performance of the Diavel Testastretta 11° DS power plant. The Diavel handlebar shape and arrangement leaves the rider feeling comfortable and in command, while a bar-riser and air-deflector design enhance the clean and minimalist look to the entire cockpit area. Wide, black-finished, tapered section aluminium bars with custom designed, integral brake and clutch master-cylinders by Brembo complete with milled reservoir tops, blend functionality with a custom shop level of attention to detail, while stylish, forged-aluminium supported mirrors deliver a generous view to the rear. Switchgear control uses Ducati’s slim-line bodies, housing easy-to-use switches and buttons and a unique weapons-like “trigger catch” that slides down to cover the starter button when activating the kill-switch. While the indicator cancel button doubles as a scroll-and-select for fast and easy Riding Mode changes, switches above and below serve to navigate the high-resolution display control panel. The heart of the Diavel is Ducati’s Testastretta 11° DS engine, an ingenious step forward in balancing high-performance with an enjoyable ride. With its 162 hp @9,250rpm and increased torque of 96.2 lb-ft (130.5 Nm) @8,000rpm, the Diavel Testastretta 11° DS engine is all about authentic Ducati Desmodromic performance. The intake and exhaust ports combined with radical adjustment of the cam timing have enabled Ducati to achieve a fantastic torque curve at low rpm, which remains strong through a wider rev-range. 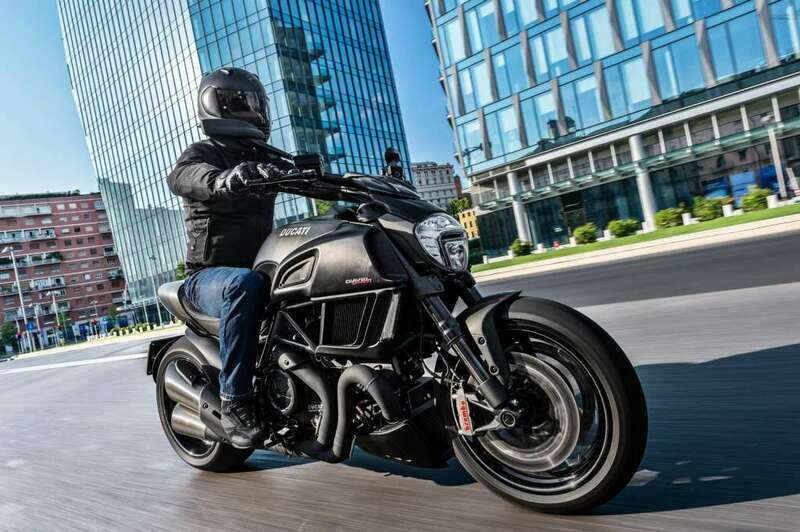 The increase in bottom-end torque is managed by Ducati’s Ride-by-Wire (RbW) system to considerably enhance the Diavel’s effortless ridability, while ensuring plenty of power remains on tap ready to be unleashed. A number of well-proven technical advancements in Ducati’s twin-cylinder technology have been combined with the 1198’s torque-laden 106 mm x 67.9 mm bore and stroke to create an exciting, customisable and user-friendly character for the Diavel. Breathing through elliptical Ride-by-Wire throttle bodies, the 1198 Testastretta 11° DS uses the fuel injector positioning to target spray directly onto the rear of the hot intake valve instead of the relatively cold surface of the intake port wall. The enhanced vaporisation achieved as the fuel hits the valve, fully atomises the incoming charge, eliminating the chance of compromised combustion efficiency experienced if droplets of fuel enter in liquid form. With the delivery of a fully vaporised inlet charge, the concept of Dual Spark (DS) with two spark plugs per cylinder-head, provides a twin flame-front that ensures complete and efficient combustion across a shorter period of time. Pistons with an 1198 Superbike-style crown shape further enhance that combustion with a higher 12.5:1 compression ratio. The engine, which is cooled by twin lateral radiators – positioned on either side of the bike and fed with highly efficient and stylish air ducts, also uses Ducati’s secondary air system, maintaining performance-optimised fuel mapping for smoother cycle-to-cycle engine operation, without compromising emissions. The Testastretta 11° engine effectively took the original fire-breathing 1198 Superbike power plant and re-engineered it with increased user-friendliness. Engineers achieved this to great effect by reducing the amount of valve over-lap from around 41° – typical in performance engines that operate constantly at high RPM – to just 11°, which reduced peak horse-power slightly, but considerably enhanced mid-range and overall smoothness. The massive 58mm (2.28in) section exhaust headers lead the 2-1-2 system through power-enhancing equal lengths before terminating in short, slash-cut silencers, stylishly angled to match the rear wheel’s radius and underlining the focus on custom detail. The stainless steel silencers are finished in black for the Diavel and natural brushed stainless steel for the Diavel Carbon. The engine management system dedicates a lambda probe to each header, providing precise fueling, while the catalytic converters provide Euro 3 conformity and the electronically controlled mid-section valve optimises exhaust pressures throughout the rev-range. The Diavel’s gearbox uses high-strength materials to manage the power output and enhanced grip generated by the 240 section rear tyre, which also requires the use of a 16mm longer gearbox output shaft for drive chain routing. The transmission features an oil bath clutch with “slipper” function and super-light feel at the lever. Its design uses a progressive self-servo mechanism that presses the plates together when under drive from the engine, enabling the reduction of the clutch spring rates. This results in a much lighter clutch lever at the handlebar, ideal in stop-start traffic or during long journeys. When the drive force is reversed (over-run), the same mechanism reduces the pressure on the clutch plates, enabling them to provide a race-like “slipper” action, which reduces the destabilizing effect of the rear-end under aggressive down-shifting and provides a much smoother feeling when closing the throttle or down-shifting under normal riding conditions. The Diavel’s clutch and alternator covers are specially styled with enhanced detail and shaping and the cam belt covers with an aluminium mid-section. The Diavel’s Testastretta 11° DS engine reaches another milestone in Ducati’s constant investment in quality by enabling the distance between major service intervals (valve clearance check) to be set at an owner-friendly 30,000 kilometres (18,000 miles). The Ducati Trellis frame uses large diameter, light gauge tubing with two lateral die-cast aluminium sections that flow into the rear subframe. This achieves massive torsional rigidity while remaining lightweight and compact. The two sections form a rear-end structure by attaching onto either side of a complex techno-polymer component. The long, die-cast aluminium, single-sided swingarm provides great “feel” at the rear-end with a wheelbase of 1590mm (62.6in) and a stance that provides lean angles of up to 41°. The Diavel uses black-bodied 50 mm Marzocchi front fork, fully adjustable for spring pre-load, compression and rebound damping. They are gripped by a slash-cut triple-clamp – cast aluminium for the lower and forged for the upper – with a rubber-mounted riser to tapered alloy bars. With a rake of 28°, trail of 130mm (5.12in) and an offset of 24mm (0.945in), the set-up provides a sure-footed and agile front-end for incredible handling and 70° of total steering lock for maximum manoeuvrability. Both Diavel and Diavel Carbon use the same suspension with fork sliders black-finished in super low-friction diamond-like carbon (DLC). 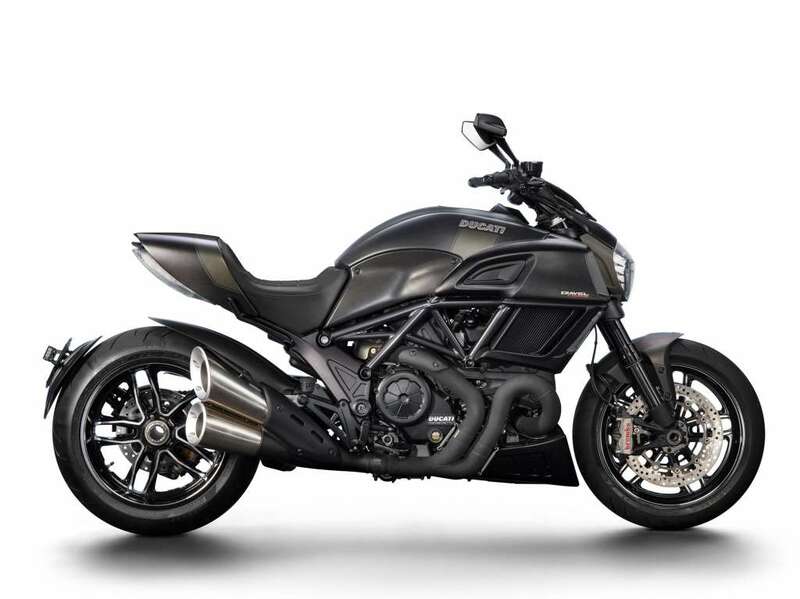 All versions of the Diavel have a Sachs rear suspension unit slung low under the chassis in a horizontal position, operated by a progressive pull-rod linkage from the swingarm. Adjustable in compression and rebound damping, the unit uses a handy control for easy spring pre-load adjustment. The Diavel rolls on stunning, custom 14-spoke wheels with machine-finished detailing. The front rim is 3.5×17, while the rear, which is “flow-formed” for enhanced structure and lightness, boasts a massive 8×17 rim. The Diavel Carbon has custom shop-finished, lightweight, forged, turned and milled rims by Marchesini that not only score an impressive total weight saving of 5.5lb (2.5kg), but also look spectacular. These highly intricate nine-spoke wheels highlight the delicate machining in natural aluminium set against a black finish. Ducati’s technical partner, Pirelli, worked with the Diavel’s designers and engineers to develop the incredible Diablo Rosso II tyres. While the front uses a conventional 120/70×17 section with a tread pattern designed for enhanced wet weather performance, the 240/45×17 rear represents the latest innovation in tyre design with a sport-oriented profile being applied to custom-style width. This tyre design enabled Ducati to achieve the style they had envisioned for the Diavel without compromising the authentic Ducati performance of the chassis. This partnership of parallel development between chassis and tyre design contributed massively to Ducati “changing the rules” in this segment. The Diavel front brakes use Brembo’s incredibly powerful Monobloc callipers, which deliver outstanding performance actuated by integral alloy master cylinders with unique shape reservoirs sporting milled tops. The 4-piston, twin radially-mounted callipers grip 320mm discs, while a single 265mm disc on the rear is gripped by a two piston calliper, also by Brembo. 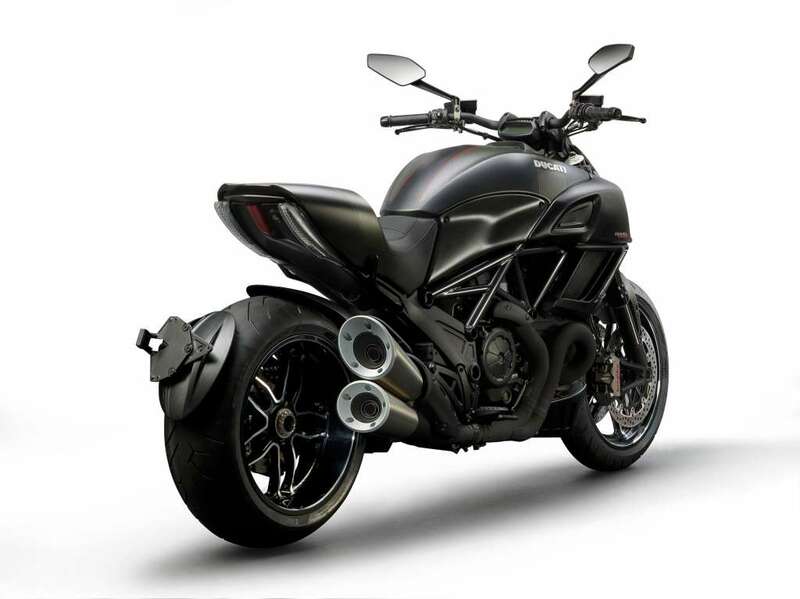 The Diavel Carbon uses specially milled aluminium disc carriers which have natural aluminium coloured recesses machined around the weight saving cut-outs in contrast to the carrier’s black finish around the centre. Typical of Ducati, these top-of-the-range components provide outstanding levels of braking and set a benchmark in this category. The technical solution employed for keeping the frontal lines of the Diavel clean was to place two highly efficient lateral radiators on either side of the bike. These well-ducted units, located beneath the fuel tank, are aerodynamically designed to draw air flow through the radiators and are assisted by high-flow electric fans when required. The design combines form and function to enhance the muscular shape of the bike. The Diavel’s instrumentation is a masterpiece of cutting-edge technology with an upper LCD display mounted on the bar-riser, providing main information such as speed and rpm, warning lights, time and temperature and a lower, full colour Thin Film Transistor (TFT) display styled into the fuel tank to provide a clear account of the current Riding Mode, gear selection and DTC setting as well as total mileage and trips. Used on mobile phones and computers, TFT technology is a variant of LCD and displays easy-to-read high resolution graphics. The Diavel’s TFT display goes one step further by using the sensitivity of its surrounding light to decide upon black or white background colour. When stationary, the lower display also doubles as the latest user-friendly control panel to personalise DTC and RbW settings within each Riding Mode before saving. Constantly developing its instrumentation technologies further, Ducati provides Diavel a fuel gauge and side-stand warning icons to the TFT display. Positioned in the top left corner of the display, the fuel gauge is animated with five graphic bars to signify fuel capacity, gradually reducing the number of bars until the icon changes from green to yellow when capacity is down to just one bar, simultaneously illuminating the fuel reserve warning list. The fuel icon is programmed to start flashing if the fuel capacity is falls to 1.1 litres or less. The side-stand icon illuminates in the central area of the display to remind riders that the stand is deployed and functions in parallel to the usual safety system, which kills the engine if a gear is selected while the stand is still deployed. The Diavel’s ignition is actuated by an electronic key in the rider’s pocket, which communicates with the motorcycle when within a distance of approximately 2 metres (6.5 ft). The motorcycle recognises the dedicated key code and automatically enables the bike’s systems. Pressing the key-on switch then activates all systems to “on” and the engine is ready to be started. The electronic key, which internally consists of a radio circuit, externally doubles as a mechanical flip-key, required to open the seat and fuel tank cap. 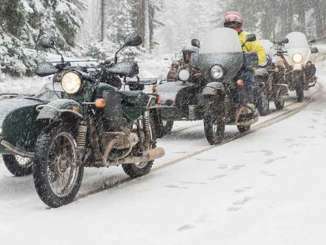 When parking the motorcycle, an electronic lock can be actuated on the steering simply by applying full steering-lock and pressing the ignition-off button a second time. The Ride-by-Wire (RbW) system is an electronic interface between the Diavel’s twistgrip and engine, which configures an ideal power response depending on the Riding Mode selected. The twistgrip no longer has a throttle cable connected directly to the throttle body butterflies, but instead delivers a signal to a control unit, which in turn operates the butterfly opening electronically. The RbW system uses three different mappings to regulate the power delivery: 162 hp with a sports-type delivery, 162 hp with a progressive delivery suitable for touring, and 100 hp with progressive delivery for city use. The Diavel incorporates the latest in innovative Ducati technologies, including electronic Riding Modes. Selectable from the left-hand switchgear – even while riding – the choice of three pre-set modes are programmed to instantly change the character of the Diavel. The three modes are enabled by combining class-leading technologies such as Ride-by-Wire (RbW) and Ducati Traction Control (DTC). The Sport Riding Mode provides the Diavel rider with an adrenalin-fuelled 162 hp ride and enables the rider to have full-on throttle response for maximum acceleration. Ensuring the full Testastretta 11° experience, the Sport mode also lowers the DTC system intervention to level 1 for riders who prefer their performance a little closer to the traction limit. 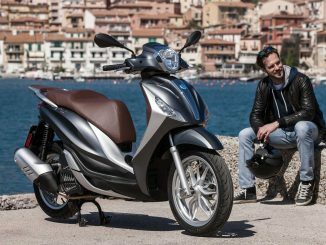 The Touring Riding Mode is also programmed to produce 162 hp, however, with a smoother, more user-friendly power delivery. Rear end traction is enhanced by increasing DTC system intervention to level 3, specifically intended for an enjoyable and relaxing ride ideal for long distance and ensuring maximum comfort for both the rider and passenger. As riding on city streets can require more attention to the surroundings than to throttle inputs, the Urban Riding Mode instantly changes the Diavel to provide a manageable and confident ride. Power output is reduced to 100 hp and DTC is further enhanced to level 5 to provide a higher system intervention during the most chaotic of stop-start traffic. The racing-derived Ducati Traction Control (DTC) is a highly intelligent system which acts as a filter between the rider’s right hand and the rear tyre. Within milliseconds, DTC is able to detect and control rear wheel-spin, considerably increasing the bike’s active safety and performance. DTC is an integral part of the pre-programmed Riding Modes on the Ducati Diavel and enables riders to fully enjoy the power of the Testastretta 11° engine. DTC levels are factory pre-set in each of the three Riding Modes, but can be individually customised and saved to suit the rider by accessing the user-friendly set-up menu. A “default” option is available to easily return all settings to factory pre-sets. The 205 kg (452 lb) Diavel Carbon embodies the true nature of the Diavel concept, where performance combines with style to celebrate Italian engineering at its best. Lightweight composites and milled aluminium components combine the two worlds of sport and style with features that are both visually beautiful and functionally high-performance. Helping the Diavel Carbon to accelerate faster, stop sooner and change direction with even more agility is a valuable 5.5 lb (2.5 kg) saving of “unsprung weight” by using beautifully forged, lightweight Marchesini wheels. The wheels, which are finished in black, are machine-turned and milled for maximum weight reduction and intricately engineered decoration. The black disc carriers undergo a similar milling process to enhance the recess around the weight saving cut-outs, the natural aluminium colour contrasting effectively against the original black carrier. Fuel injection Mitsubishi electronic fuel injection system.Mikuni elliptical throttle bodies with RbW. Mitsubishi electronic fuel injection system.Mikuni elliptical throttle bodies with RbW. Clutch Light action, wet, multiplate clutch with hydraulic control.Self-servo action on drive, slipper action on over-run. Light action, wet, multiplate clutch with hydraulic control.Self-servo action on drive, slipper action on over-run.